Artist-verified tab and standard notation from this EP of gypsy-jazz standards. 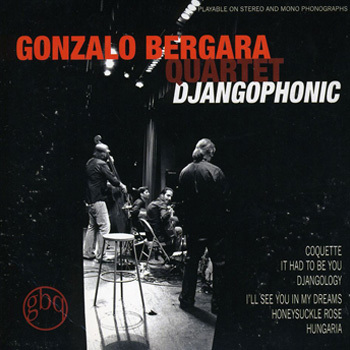 In this fantastic 2009 release, Gonzalo and band rip through six gypsy jazz standards. Here’s your chance to learn dozens of Gonzalo licks, plus the band’s fresh arrangements of classic songs. Each transcription features the original studio recording, perfectly synced with sheet music (standard notation) and tablature for Gonzalo’s lead guitar — and even Rob Hardt’s clarinet. Gonzalo has verified all the tab himself. Enjoy!